One of my coworkers, whose last day was Friday, came up to me the Tuesday before and said, "You know, I can't believe you didn't bake something in honor of my last Tuesday!" So, I agreed to bake something for his actual last day that Friday, since I had already been working on a cookie recipe that I wanted to experiment with a little bit more. The chocolate cookie by itself is surprisingly not very sweet, which I do enjoy, since too sweet desserts just really don't do it for me anymore. And while the cookie was ultra soft and studded with chocolate chips and pecans, it really wasn't chocolatey enough for me, so I made the recipe again, this time replacing some of the flour with even more cocoa powder, using black as night cocoa powder and a little sweetened coconut to balance out the bitter chocolate. So with the dough refrigerating overnight so I could get right to baking the next day after work, I went to sleep, happy with the satisfaction of creating a better recipe. I almost stopped there, but I'm so very glad I didn't. 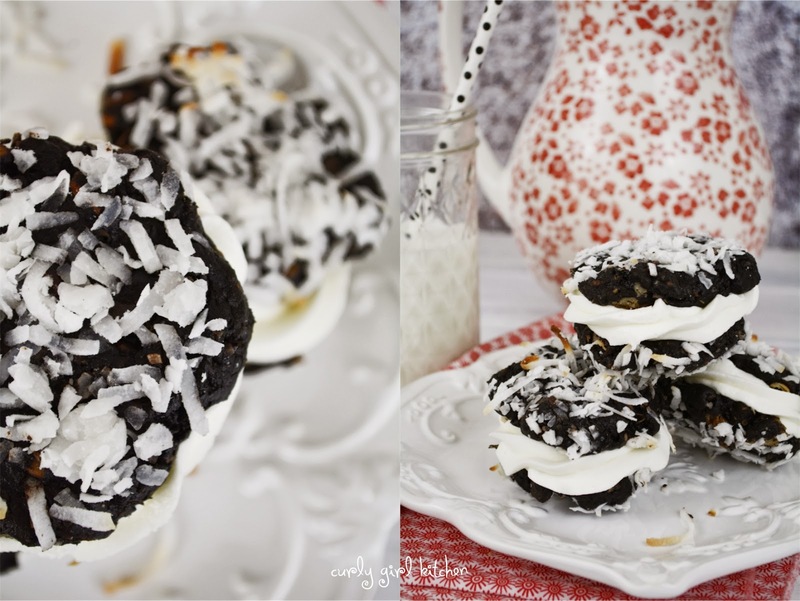 You see, these cookies wanted to become a sandwich cookie, which they must have whispered to me in my dreams that night, because the next morning I woke up knowing that they wouldn't be right unless they were filled with fluffy coconut buttercream with a hint of cream cheese. 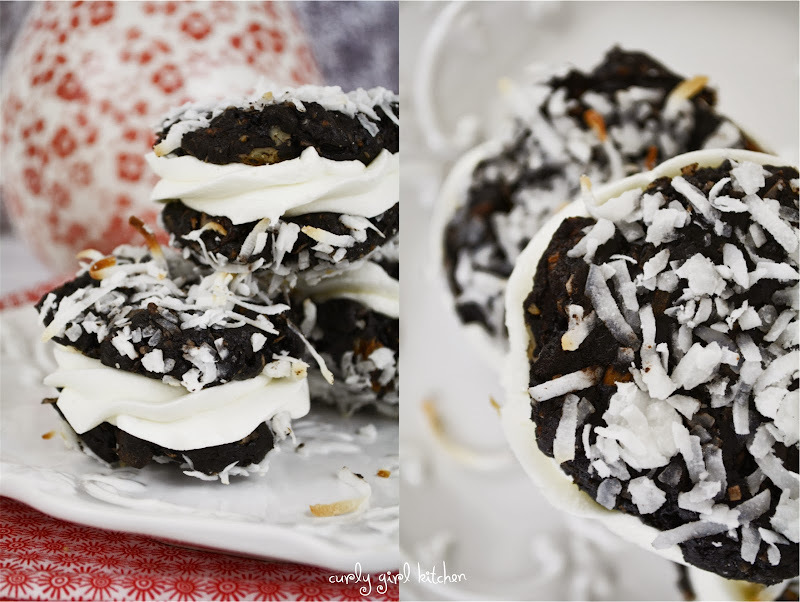 I coated the cookie dough with more coconut, and the white flakes looked so pretty against the black cookies. 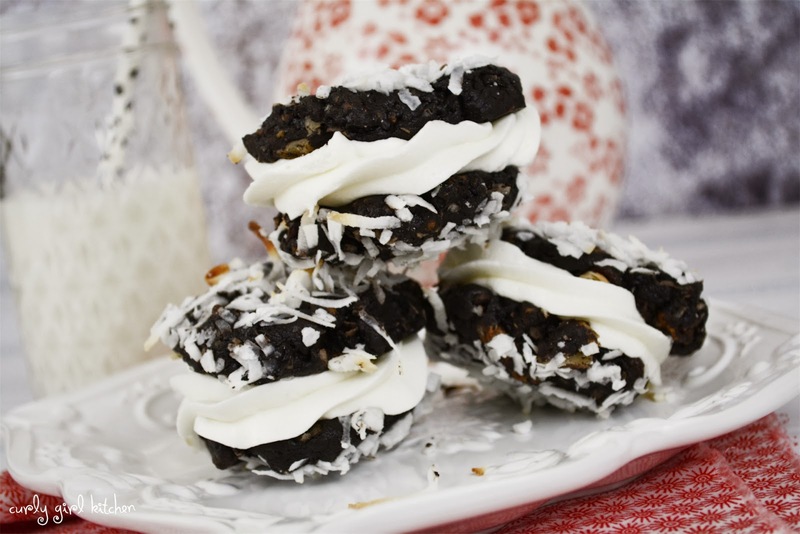 After barely baking the cookies, they emerged soft and gently puffed up, with the coconut ever so lightly toasted. The cookie aroma permeating the house at this point was intoxicating, and the air was full of dark chocolate and sweet coconut. As hard as it will be, let them cool completely, unless you really want to skip the buttercream and eat the cookies warm. 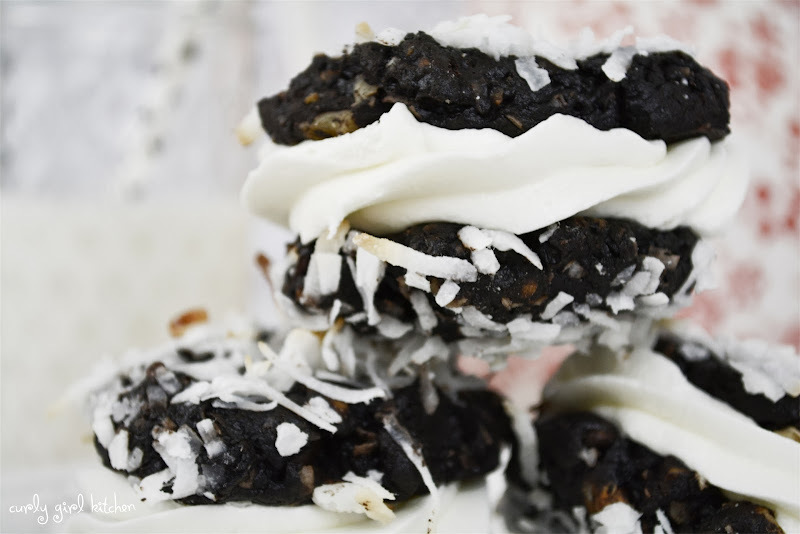 But buttercream and hot cookies are the worst of friends, and you don't want a melted mess on your hands if you get in a hurry and pipe buttercream onto cookies that haven't sufficiently cooled. These cookies were referred to as "Oreos on Steroids" the morning I brought them to work, which is the sort of compliment I love. 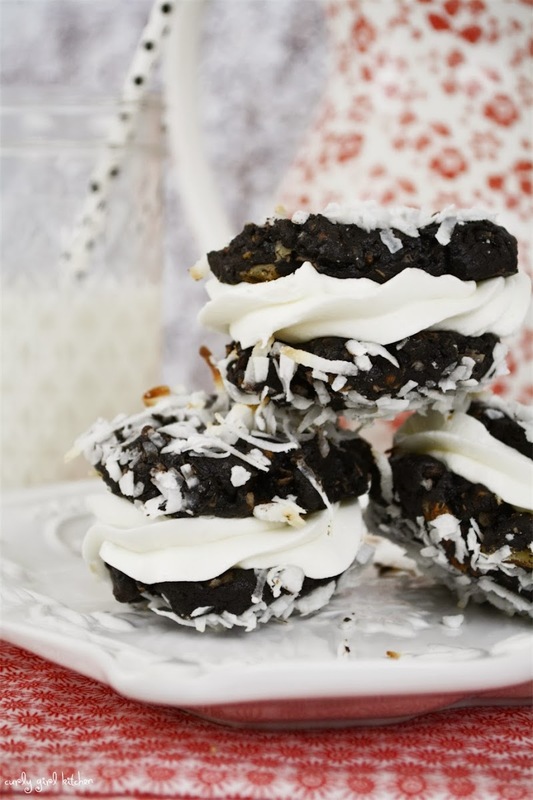 And if coconut isn't your thing, it can easily be omitted for a truly fantastic, homemade soft Oreo cookie experience. But personally, I recommend the coconut. In the bowl of your stand mixer fitted with the paddle attachment, beat the butter, cream cheese and sugars on medium speed for 3 minutes. Beat in the egg and vanilla and scrape down the bowl. In a separate bowl, combine the flour, cocoa powder, salt, baking soda and nutmeg. Add by spoonfuls, mixing on low until combined. Add the milk or cream, just enough to moisten the dough. Stir in 1/2 cup coconut, and the chocolate chips and pecans. The dough will be thick. Cover with plastic and refrigerate for 2-3 hours, or overnight. Preheat the oven to 350 and line a baking sheet with a silpat or parchment paper. 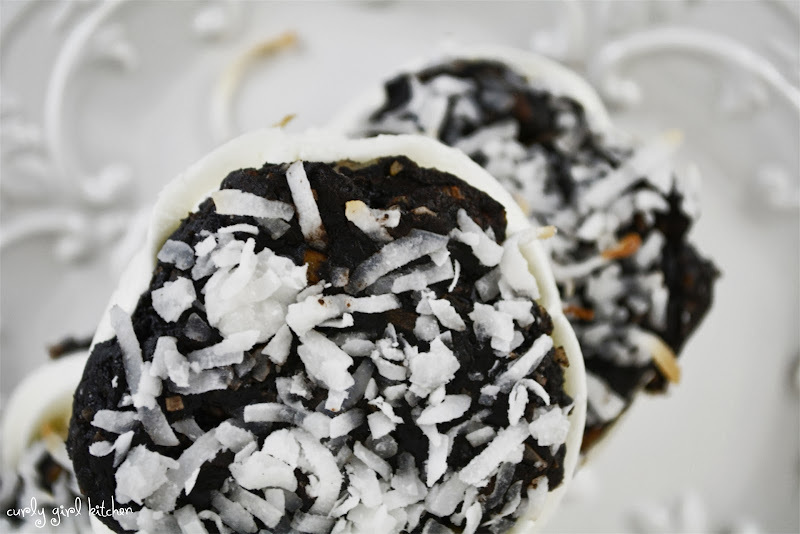 Place the remaining 1 cup coconut in a small bowl. 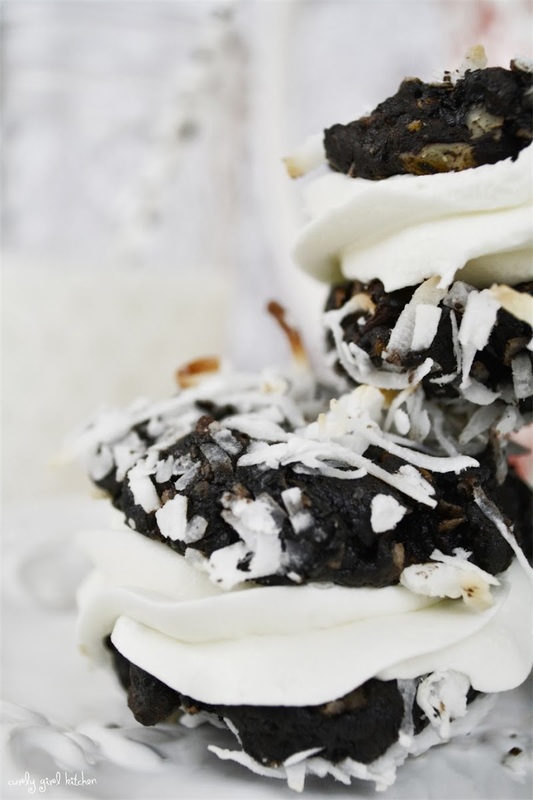 Scoop rounded tablespoonfuls of dough, flatten with the palm of your hand, press one side against the coconut and place two inches apart on the baking sheet, coconut side up. Bake for 7 minutes, cool for 1 minute on the baking sheet and then carefully transfer to a wire rack to cool completely. 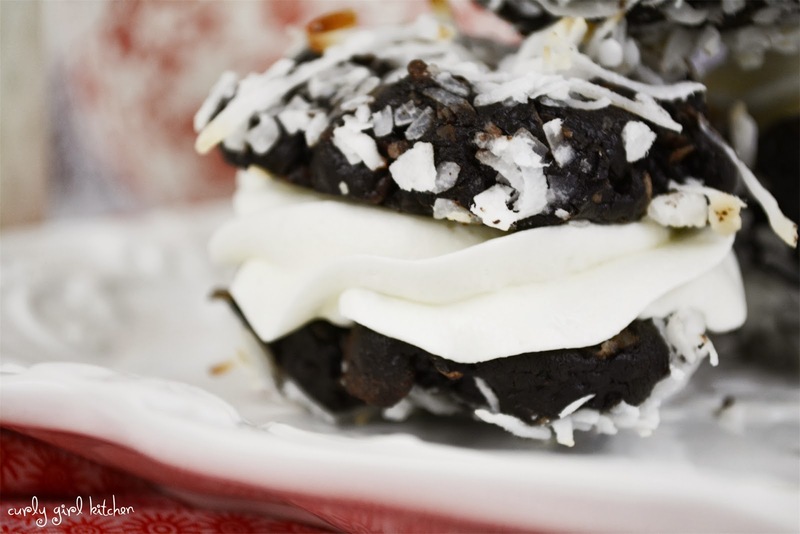 For the frosting, mix the butter, cream cheese, powdered sugar and meringue powder on low to combine. Add the extracts and cream, and whip on medium high speed for 5 minutes, until very light and fluffy. 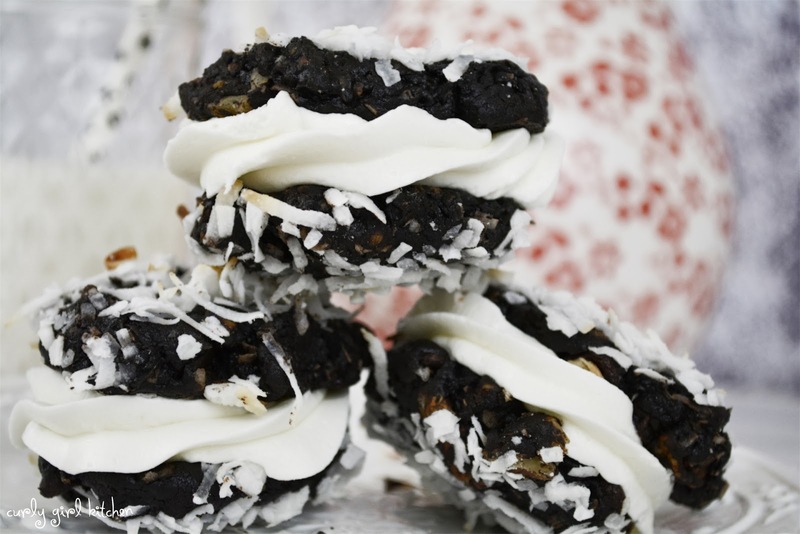 Pipe or spread onto the bottom side of half the cookies and top with the other cookies. Store in an airtight container for 3 days or refrigerate for up to a week.